Hurry now to VineByDesign.com and buy your copy of this high quality, full color 12-Month calendar. You will find it to be loaded with local festivals and winery events from all over the Sooner State. 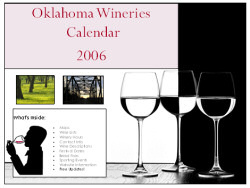 We make these calendars ourselves, right here in Oklahoma, so you can expect fast free shipping on your order.